A few months ago, when the Dark Eldar samples had just hit the GW stores and FLGS around the world, the master of this very blog (Ron) expressed concern that not only would the standard army painting apathy affect the number of painted Dark Eldar armies, but that their intricate nature would further reduce the number of painted armies around. I think Ron was just having a bad day, but I suggested we should collaborate on something to show how easy it could be to have a sharp looking Dark Eldar painted quickly. I picked up a box of Dark Eldar Warriors (despite having no plans to build an army) and finally got the chance to paint one up, photographing as I went. Here are the quick steps I used to paint up my Kabalite Warrior. Step One - prime black. Step Two - light drybrush of Hawk Turquoise. Make sure this is a light drybrush with a big brush (I used a Tank Brush), and just catch the sharp, raised edges. Step Three - lighter drybrush of a Hawk Turquoise/Skull White mix (roughly 50/50). This should be lighter than the last drybrush. Step Four - hit the highest highlights with a Hawk Turquoise/Skull White mix (roughly 25/75). Make sure these lines are very thin. Step Five - wash the armor with Thraka Green. This will help blend your highlights and drybrushing. If you were over zealous with your drybrushing, then hit the armor with a few more layers of Thraka Green. Step One - Paint the flayed skin with Tallarn Flesh. Step Two - was with Ogryn Flesh. Step Three - highlight with Dheneb Stone. Step One - paint the gold parts with a mix of Scorched Brown/Shining Gold (roughly 50/50). Step Two - highlight with Shining Gold. Step Three - highlight with a 50/50 mix of Shining Gold/Mithril Silver. - paint the eyes and surounding edges with a 75/25 mix of Snot Green/Chaos Black. - highlight eyes and edges with Snot Green. - highlight eyes and edges with a 40/60 mix of Snot Green/Sunburst Yellow. - highlight eyes with Sunburst Yellow. - wash area with Thraka Green. - paint the metal with a 50/50 mix of Chaos Black/Boltgun Metal. - highlight with Boltgun Metal. - touch up all the black areas with Chaos Black. - highlight with a 50/50 mix of Chaos Black/Dark Grey*. - highlight with Dark Grey*. * Dark Grey is from the Vallejo Model Color range. All in all this model took just under an hour to paint, including stopping to take a photo after almost every stage. Perhaps next week I'll try it out on a Wyche. I hope you like what you've read here and are ready to paint up your army of awesome Dark Eldar models. - A huge thanks to Dave for sharing this with the community. As soon as Dave came up with this idea, I knew there was no way I could decline the offer to do something like this. My FLGS graciously agreed to let me borrow the store's Dark Eldar sprues and I built my own Dark Eldar warrior. 1. I don't drybruah much at all. But, the use of washes over careful drybrushing can give you a great feathered highlight effect. I was amazed to see how the drybrushing blended into the black after 3 washes. It really toned down the highlight and blended it into the armour. I needed 3 layers of washes because I don't know how to do it that well yet. 2. You still need to be able to do some fine line highlighting to get that "finished" look. 3. It doesn't take a ton of detail to make these guys look tabletop ready. If you think about it, all that was painted on these was the armour, flayed skin, metal areas and the eyes. 4. Never underestimate the ability to go back and clean up your work. For example, the armour. After drybrushing and washing, being able to go back in with black and clean it up made a huge difference in the final look. You can really tidy things up. So there you have it folks. 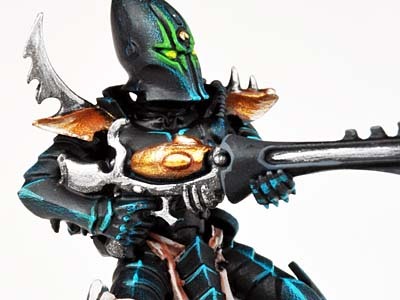 It is possible to get a nice looking Dark Eldar army in a fairly short time provided you're willing to invest a little bit of effort into your models. Dave was able to do it, I was able to do it using his techniques and you should be able to do it as well. And... Dave was kind enough to put his Dark Eldar painting process into a short PDF that you can download here for reference when it comes to painting your own Dark Eldar force. NOTE: This technique also scales up to do vehicles quite well too. I used it to paint a Necron Ghost Ark to tabletop quality real quick and got some nice results. You can check out more of Dave's work at his own blog, Dave Taylor Miniatures. I would have approached it a little differently myself, but I can't argue with results and I have to say, those results are incredibly nice. The results are really nice, far better than the limited time spent on them for sure. Not a fan of the golden shoulderpads though, but that's my personal sense of esthetics :) I am seriously considering this way of painting armor for my Wyches. I am still struggling with deciding what to do with the naked skin though. Want to go for a blueish pale look. Simo: It's worth trying, if nothing else, it might get you started on a new approach. Mister Feral: Thanks, hopefully it shows folks it's not impossible to do. oni: Thanks. I too would have done it differently myself, but decided to try something new and see how it came out. Like I mentioned, I was pleasantly surprised at the results and can see how it might help get an army of these guys painted quicker to a good standard. You know it's funny. i'm using a very similar style for the DE that i created for myself. Major differences being color choices and I'm basing white and layering washes for my "undercoat / majority color"
But yeah once I finish the basing/washing process (which takes a couple hours to make sure the washes are completely dry) Using my method (and I'm sure the one shown here) I can complete a kabalite warrior from 'base coated' to done in about 40 minutes. The models are amazing but not nearly as intimidating to paint once you finish one or two of them. It looks fething sweet but I'm not convinced I'll manage a whole army , Dave , any chance you would be willing to look at my scheme and deconstruct it for a fast but good quality tabletop ready model like the ones shown here ? Anything that helps me avoid hours of miserable pain painting would be a blessing. Nice tutorial , mind if I link it from my blog ? The one thing that I really hate that GW is propagating is the "glowing eyes" effect. Am I the only one who thinks this looks really dumb on the DE? Very nice work to you both! I'm just getting cracking painting up the Dark Eldar I've managed to assemble, and so this guide is not only timely, but incredibly detailed and helpful! I'm going with a red-based theme with mine, but I can easily see the tips you've provided working quite well using the alternate colors I've chosen. Thanks for posting this great article! I was going to post something here but I decided the keep it for the collaborative post. Anon: It takes me a whiel too since I had to use a number of washes and I like to make sure they are completely dry as well. Sorrowshard: Link away. The more people who see this, the more it might help out. Anon: I think the glowing eyes has it's place. Not on every model, but some look much better with the effect than others. I blame dave, he did it, so I had to as well. Mordian7th: Glad it helped. I'm almost certain the process would work the same with other colors. It might some fine tuning, but you should be good to go. Da_Sub: Then I'll be looking for your article so I can add it there. Just gotta pick up a box of Hellions in the morning from Ace Comics & Games. It's always nice to learn more tips for fast and effective paintjobs. The combination of drybrushing, line highlights and washes looks very effective. Another thing I learned when attempting my own fast paintjobs is that it helps if you get the armour finished quickly so you can devote some time to the details. Also the contrast of dark armour and bright details works very well. 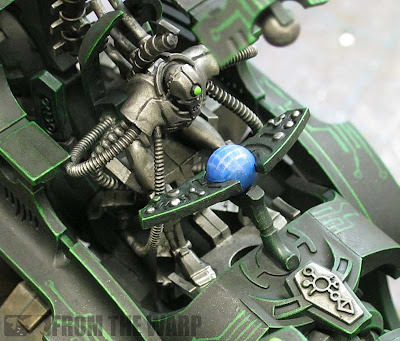 One can see that in this article where the bright eyes and flayed skin contrast nicely with the dark armour. In general good colour choice and carefull planning can help a lot when you need a "shortcut" to a quick and nice finish. If you'd use reds for the highlights, which colour should you use for blending into the black primer? Keyan Sark: If you're talking about the drybrushing part, I might try a pink or even a light tan color. If you're talking about the washing part, it would most likely be Baal Red, Devlan Mud and Gryphonne Sepia for me. I had a go with this colors as I just started my dark eldar army. Those figures brought me back to 40k as I was stuck to fantasy. Though I did a couple of steps differently and the result I can say is smoother and more realistic. I will place only the differences between my procees depending on this one. I tested it in a reaver jetbike and I can say that it looks impresive and very dark eldarish! -I undercoat the mini with black primer. -I basecoated the miniature with a 50/50 mix of leviathan purple/black, instead of simply black. This gives a warmer color base which reacts match better when washing. -I ignored the drybrushing. I am not a fun of drybrushing, I prefer waterblending instead. In this case I went straight to the highlights. -I did progresive highlights starting with clean hawk turquoise following all the lines of the miniature. Then I highlighted with a 50/50 mix of hawk turquoise/white. Finaly a fine detail on the edges with a mix approximately of 10/90 hawk turquoise/white. This color looks like space wolfs grey but in a blue-green tone. -I applied 2 thin layers of thraka green wash (waiting to completly dry between each coat). The final result is a smooth fade in the highlights. the basecoat looses the purple tone and turns greenish and matches much better with the hawk turquoise that turns also green-blue. It looks like a lightning effect in a green tone after all. I hope that it is a good additional based on this tutorial. Time was about 1,5 hours on the jetbike, and I'm not a fast painter. Scarecrows team administrator: I'm a big fan of line highlighting as well myself. 2. To get a real fast result with limited techniques. To that end, we wanted to show how to do this for those who might otherwise be a bit nervous about trying it themsleves. For those who can wetblend and line highlight, this kind of post is not really going to help them. Being able to do those kind of advanced techniques will almost always yeild better looking results. Thanks for sharing you step by step to get them too. Amazing - I'm going to do my dark eldar like this. A better version of the poisoned tongue! Joe R: Excellent, glad it helps. Ron, thanks so much for posting this, and thanks to Dave for writing it up in the first place. I just started a DE army and had no idea how I was going to get that edging effect, and this tutorial saved me a lot of experimentation. I didn't use blue for my army, instead I started with Goblin Green then Scorpion Green then 50/50 Scorpion Green/Skull White. And I never would have thought to start with a base of Brown/Gold for the gold bits. I will be using that technique on a LOT of models in the future. It looks incredible! Gailbraithe: Excellent, glad it helped! 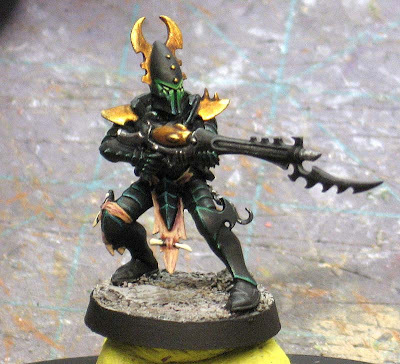 After days of trying to put clean high lights on my dark Eldar I was start to get rather stressed and upset. after looking a what you did here I re base coated my guy and I'm going to try it tomorrow. Thank you both so much of making this! Harmless: Hopefully it works out better for you. I just finished scaling the effect up for a vehicle that I'm working on. It takes a bit of cleaning up to get super nice results, but it goes quick. How would you do this on a Raider? I think the hull is too flat for the drybrushing to be effective. Any ideas? Eddie: It works perfectly! Link and picture added to the bottom of the post to show you how it works. On a raider, it would just be a matter of controlling the angle of your brush when drybrushing so you hit the edges and minimize the amount of paint you get on the flat surfaces. For speed, simplicity and quality this is one of the best painting tutorials I've come across. I managed to come up with a good looking model rapidly substituting a few of the paints for my own choices. Good job. Anon: Thanks! Glad to know it worked and you were able to make it into what you needed for your army.